Welcome to the inaugural TyranoBuilder Summer Game Jam, a contest for games created in TyranoBuilder Visual Novel Studio! The development / submissions period is from Aug 17th to Sept 18th 2015, and judging will be carried out over a month period by Nyu Media and our panel of guest judges who have generously donated their time to participate. After this time, the winners will be announced and prizes awarded. 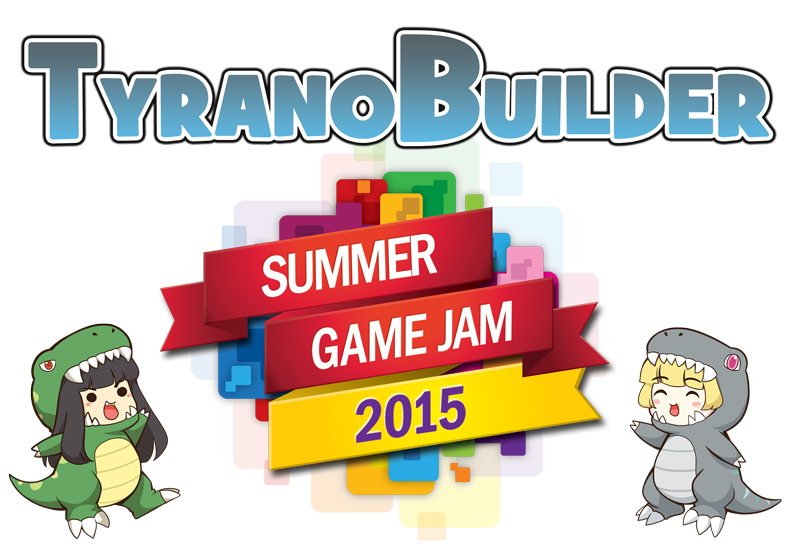 For questions or to discuss the game jam, please visit the official TyranoBuilder Summer Game Jam 2015! thread at the TyranoBuilder Discussion Group at Steam. Any new announcements or updates will also be posted there as well as to the Nyu Media Facebook and Twitter accounts, so please drop by occasionally! There is no fee - this is a free contest! Submissions open at 09:00 August 17th 2015 and close at midnight, September 18th 2015, Pacific Time. All submissions must be created using TyranoBuilder Visual Novel Studio. Windows or Mac standalone application, OR browser game. Sorry, mobile games will not be accepted for judging. Please upload your game as a single .zip file. The theme for this game jam is, "United by fate". All games must exemplify the theme in some form. If you feel that the link to the theme is unclear, please include an explanation of how the theme is fulfilled in a text file in the root directly of your game. Playtime should be approximately 30 minutes . * The Live2D Prize will be awarded to the the game that makes the best use of TyranoBuilder's Live2D functionality. See the links below for details about Live2D and how to use it in TyranoBuilder. That about covers it! If you any questions, comments, etc. please post them to the TyranoBuilder Summer Game Jam 2015! thread at Steam. Otherwise, please help spread the word and GOOD LUCK!! We look forward to playing your game! Elias struggles as a mute in a world run by spoken magic. His life changes forever when he follows a beautiful song. The tale of a Flamingo who goes on a journey to save the world. In the near future, a sibling rivalry sends Saria on a journey of knowledge, friendship, and inner growth. The tale of a WW2 Nazi soldier who abandons the war machine for the sake of his own humanity. Created for the TyranoBuilder Game Jam! Linear Visual Novel for Tyrano Builder Game Jam 2015 - Note: Because time there might be a few mistakes. Getting Through is a visual novel using color and sound to tell the story of two strangers caught in catastrophe. Can you make this couple break up?